Heart FM // Zigazig Ha! Click here to check the pictures. If you missed the show, you can catch all the best bits below… including the most embarrassing thing that’s ever happened to Ant on live TV and what the boys guilty pleasures are! We asked you for your questions for Emma and the boys and you definitely didn’t disappoint! Click here to check the audios. The baby doll dresses are in a trunk in the attic and the hair is no longer clasped in bunches. Yet, 38 year-old Emma Bunton still bubbles with the enthusiasm of a teenager. These days, the energy isn’t focused on her old pop group and careering around the world but in her new career as a radio presenter, now fronting Heart FM’s Saturday show, (formerly Real Radio). Yet, isn’t this a little less satisfying? The lady who once performed the likes of Wanna Be to tens of of thousands of people at a time is now talking into a microphone for a living. Radio is, of course, the theatre of the imagination, but on radio you don’t get to see the audience. And you certainly don’t hear the applause. “When I took on the job at first I did wonder how I’d feel about it,” she reflects of her three years on the Heart breakfast show. Emma says appearing on radio this is a very different form of performing. Pop stars often find it hard to reinvent themselves after enjoying global popularity. Gary Barlow’s recent TV documentary highlighted how hard to can be to be idolised one minute – and ignored the next. “I knew when the Spice Girls ended I’d have to do new things. And it was scary. But my mum has always been a great role model. “She took up karate at the age of 40 and now she’s a black belt and a teacher. She’s taught me anything is possible. “I want to do so many different things in life, to take on new challenges. While she has had Jamie Theakston as her radio wing man for three years, she’s now flying solo. She adds, grinning: “Why do a job if you don’t feel your being challenged? Does she like the music format? Has she played any Spice Girls records? Emma reveals she was always a budding radio presenter. Emma has had a successful solo career, releasing albums and presenting on television, working as a judge on the ITV skating show Dancing on Ice. In 2012, she reprised her role as one of Edina Monsoon’s disgruntled clients in a revival of the BBC’s Absolutely Fabulous. But will the Spice Girls be revived? It’s been rumoured they will tour with the Backstreet Boys. Emma’s life is pretty full. “I’ve been working with Unicef for the past couple of years and there’s another project coming up. Emma Bunton presents the Celebrate Saturday show from 5pm to 7pm on Heart FM. Listen to Emma Bunton talking about Victoria’s birthday dinner to Heart Breakfast. Thanks a lot to Javi. The pictures will be add soon. So our own @EmmaBunton will be performing at the @RegentStreetW1 Xmas lights switch on… But who will she be duetting with? @HeartLondon: So… @RegentStreetW1 Xmas lights switch-on… @emmabunton and @MelanieCmusic back together on stage! Excited? 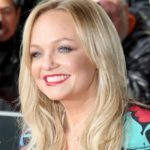 Emma Bunton sings a bit of the Spice Girls classic “2 Become 1” on Heart Breakfast with James Corden. Im having ‘eargasms’ here!!!! BUNTON, could you please record another 100 solo albums please?!?! You can see the one Emma wrote for Jamie here. Heart just opened a new Youtube channel for Heart Breakfast with Emma and Jamie: HERE. 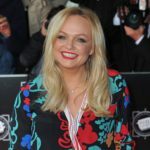 Listen to what Emma had to say about yesterday’s meeting with fellow Spice Girls Geri Halliwell and Melanie C and to Lionel Richie’s phone call to the show. Listen to Emma talking about her experience at the Isle If Wight Festival and… did she burp live on the radio? Yeah, she did. But she’s Baby Spice, she can do whatever she wants! 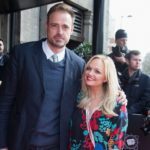 Emma Bunton and Jamie Theakston interview the guys from The Wanted.